This video explains the difference between the U.S. survey foot (sFT) and the international survey foot (iFT) and the importance of this distinction when working with map projections. It will be helpful to surveyors, planners and anyone who needs to convert map coordinates from meters to feet. This resource is hosted on COMET's YouTube Channel. 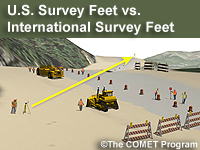 Recognize the difference between U.S. survey feet and international survey feet as it applies to potential errors in the surveying and mapping process.